The Design task of the competition is quite challenging: development of preliminary urban and architectural development design whose basic purpose is to encourage transformation of the space in an urban area with new program, spatial and landscape qualities. 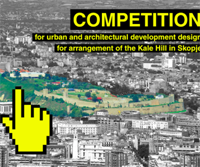 The Competition for preparation of preliminary urban and architectural development design for arrangement of the Kale Hill in Skopje constitutes an integral part of the project Kale – Cultural Fortress, organized by the Museum of Contemporary Art in Skopje, with the goal of encouraging the revitalization and spatial arrangement of the Kale Hill into an attractive and vibrant city attraction with various cultural, educational and recreational functions. Two important cultural monuments dominate the Kale Hill: The mediaeval fortress – Kale and the Museum of Contemporary Art. The exceptional historic and contemporary significance of these two imposing structures for the City of Skopje have been largely diminished due to many years of neglect of the broader location of the Kale Hill. Feeling the detrimental consequences of this situation regarding the availability to the public on one hand, while being aware of the enormous potential of this space in possible support and expansion of the diversity and attractiveness of our programs on the other hand, the team of the Museum of Contemporary Art in Skopje, by announcing this competition for preliminary design proposals, encourages bold and innovative, but at the same time simple and feasible ideas and concepts for cultivating the Kale Hill into “cultural fortress” and the public interest. Within the general competition framework, the proposals should also consider and emphasize the natural advantages of the location and its contents from the aspect of proximity to the central city area; the vibrant morphology of the terrain and in that sense its recreational capacities; topographic diversity with multiple places that provide wonderful views of the city panorama and the landscape of the Skopje valley. The second, equally important component of the project proposals, refers to the Kale Hill, as unique public space integrated with dynamic cultural content, for which the Museum of Contemporary Art in Skopje is the primary program platform, including organization of artistic, sculptural, architectural, performance, multimedia, residential, educational seminars and workshops and other types of interdisciplinary or community projects and public events. 7. Assistant Professor Meri Batakoja, PhD; Faculty of Architecture – Skopje. The competition announcer shall inform the participants about the results maximum 5 days following the completion of the evaluation.